If you have been unfortunate enough to have been knocked off your bike your first thought is to contact your insurance company... BUT ... 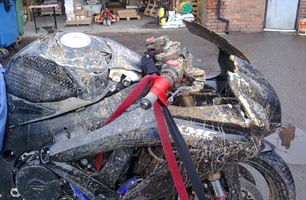 If you call us we can arrange collection of your stricken pride and joy, get you a courtesy bike, get your clothing replaced, get you injury compensation, protect your no claims bonus, get you legal representation and get you loss of earnings! 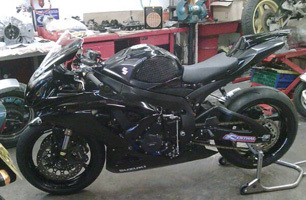 Plus... fix your motorcycle or get you the salvage rights in the event that it's written off. Unlike going through your own insurance company you don't pay the excess or have to wait months before you see any money, in most cases you recieve payment within 4 - 6 weeks and your insurance is fully protected. "Fantastic! The increase in power is awesome. Thanks to Nick and the boys at RRP for doing such a great job "